Jeanne Bishop is a Cook County assistant public defender at the Second Municipal District Courthouse in Skokie, Ill. Photo by Michael Goss. Barbara Mahany ’82 MS is a freelance journalist and the author of Slowing Time: Seeing the Sacred Outside Your Kitchen Door (Abingdon Press, 2014). Public defender Jeanne Bishop believe that criminals can be redeemed, rehabilitated and forgiven — even her sister’s murderer. Jeanne Bishop in early-morning mode moves with the speed and the purpose most of us could only wish for. And only if fueled on a tank or two of high-octane. Doesn’t take long — nor too many double-time strides — to realize this is Bishop’s default setting. She’s among the first to trickle in among the rows of government-issue desks, where all day long the accused, the paroled and assorted hangers-on will line up, take a number, hope for a break — or maybe just someone who’ll look up and listen. Then, she’s down another aisle, around a corner and ducking into the three-desk office — no bigger than a coatroom, really — she shares with two colleagues and an intern. On the wall beside her desk hangs a glossy poster with the word “Innocent” spelled out in white-on-black text, and perched atop her bookshelf, a charcoal etching, the face of a young and beautiful woman. 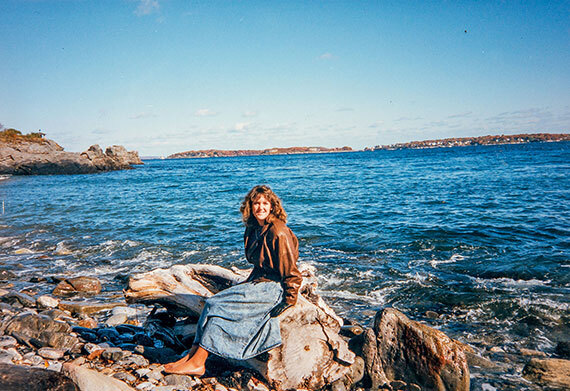 Nancy Bishop Langert in Edinburgh, Scotland, in 1990, shortly before she died. 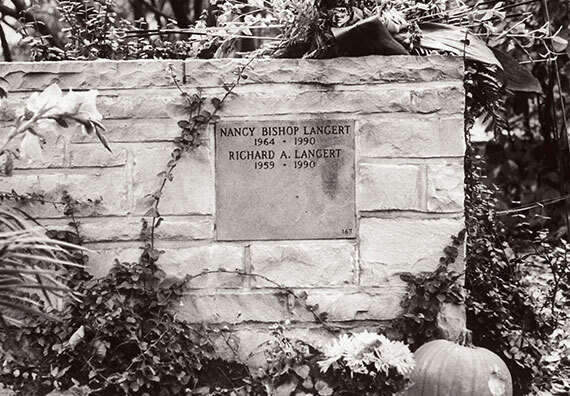 “That’s Nancy,” she says of her kid sister, Nancy Bishop Langert, who was murdered, along with Langert’s husband, Richard, and their unborn child, on April 7, 1990, in the basement of their Winnetka, Ill., townhouse after a 16-year-old junior at New Trier High School, a teenager with a thing for trouble and guns — specifically, a stolen .357 Magnum — broke in on the eve of Palm Sunday. The teen, dressed all in black, wearing gloves, toting handcuffs and the loaded revolver, used a glass cutter to make his way quietly in through a back sliding door. He’d picked the townhouse, he would later let on, only because it had an unlocked back gate, and that would make for unhindered escape. He waited in the shadows for the couple’s return, then ordered them down the stairs, where he shot Richard in the back of the head and pregnant Nancy in the side and the belly, and left all three to die. In her own blood, Nancy would draw a heart and a “U” on the cold cement floor, next to her husband’s slumped-over body, as she lay dying. 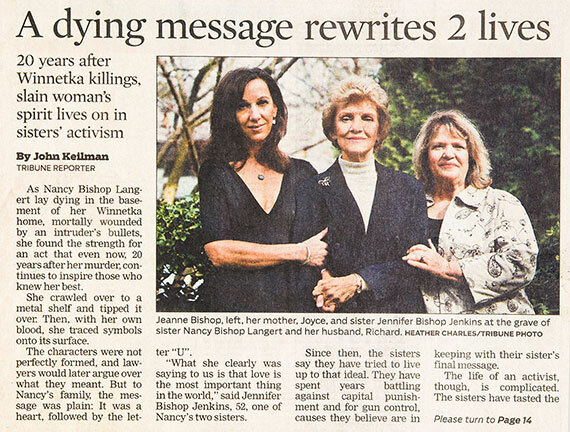 From the moment that blood-scrawled final message was discovered, Bishop believed it was her sister’s undying plea: Live a life of love. And it is Nancy, who was 25 when she died, to whom Bishop, five years her elder and now 56, has dedicated her life’s work. That dedication plays out in Bishop’s day-to-day dealings with defendants and, far beyond any courtroom, as one of the clearest and most compelling voices in the national conversation calling for juvenile justice reform, abolition of the death penalty and a rare strand of forgiveness and mercy that demands not merely words but action — in her case, face-to-face encounters with her sister’s killer. Now she’s published her story — a plotline of reconciliation, remorse and redemption that led her through years of refusing to even say aloud her sister’s killer’s name, to visiting him in prison every couple months — in a book titled Change of Heart: Justice, Mercy and Making Peace with My Sister’s Killer (Westminster John Knox Press, 2015), and it’s a story that is riveting readers. At the start of this particular workweek at the Skokie courthouse, Bishop taps out an email or two, grabs a stack of files, makes copies of felony charges filed over the long weekend, and she’s off. Half a plastic cup of orange juice in hand, her boot heels clicking along the tile hallways, she’s speed walking to courtrooms 108 and 209, the two chambers of justice where this day she’ll be the public defender juggling arraignments, warrants, plea bargains and a motley band of probation violators. She barely sips the juice before unspooling the thoughts that have animated her morning, a stream of consciousness that signals how deeply she practices the compassion, the tender mercy, she preaches. The low murmur of jurisprudence, at least as it’s played out in the green-carpeted box of this courtroom, with row after row of blond-wood benches, is not always one of such decorum. Even with steely-eyed bailiffs barking out reprimands and warnings, whispers give way to long strings of expletives among those who wait hours in the courtroom’s straight-backed pews. One probationer leaps up when told not to, two nearly get in a fight. And through all of it, Bishop, who is tall and rail thin, moves with the grace of a dancer, or maybe a swan. By the time the day’s last case is called, Bishop will have stepped to the bench on behalf of clients charged with a litany of felonies: credit card fraud, DUI, driving with a suspended or revoked license, theft while on probation for burglary. Some got stepped-up probation, one was put away — a year in prison — for a second such offense. Except for the rattling of handcuffs and the ka-chink, ka-chink of court files being date-stamped, it’s all a drama declaimed in whispers and dry legalese. At a café table tucked off to the side, Bishop’s words and her story tumbled in sharp relief to the quotidian clatter all around. She’s unflinching as she bares her own chafings and the rift, now mended, that her evolving belief had caused in her family — between her and her mother and her surviving sister, Jennifer, who do not buy into Bishop’s commitment to sitting down across from David Biro, her kid sister’s killer, and allowing the seeds of true forgiveness and remorse and redemption to flourish. In the 25 years since the killings, Bishop has moved from one side of the juvenile justice debate to the other. Even in the early wake of the murders, she and her sister Jennifer had been activists in abolishing the death penalty. But they’d stood firm in their belief that juveniles could be sentenced to life in prison without the possibility of parole. 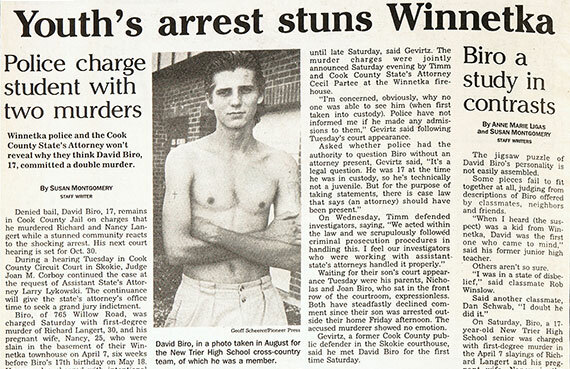 In fact, Bishop had lobbied the Illinois legislature to stop a bill that would have abolished juvenile life sentences. And she had long been a voice insisting that Biro, and others like him, should be locked away forever, even if they had been forgiven by the victims or their families. 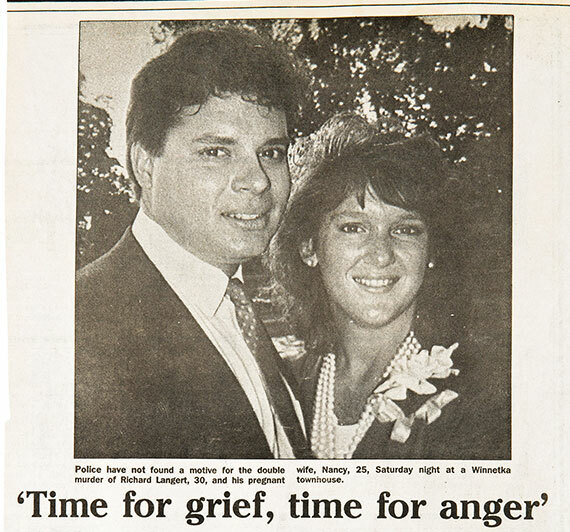 It was those few pointed questions — those of her children and that of the ex-prosecutor, a longtime ally in the movement to abolish the death penalty — that shook the ground on which Bishop had so solidly stood. So when Bishop talks of her hard-won change of heart and how it all flows from her unwavering faith in a Jesus who uttered the words “Father, forgive them” as he hung on a cross, you can’t help but realize she’s made of rare stuff and her brand of mercy and justice is one worth listening to closely — no matter your personal stance on religion. “Jeanne shows us that we don’t know what any of us is capable of,” says Bernardine Dohrn, retired associate clinical professor of law and the founding director of Northwestern’s Children and Family Justice Center. “The stories we tell ourselves, that some people are monsters and the rest of us are fully human, are obviously not true,” says Dohrn. “In Illinois everybody should know that. 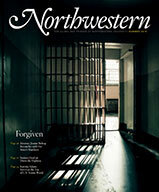 We have had 20 people on death row in Illinois who became fully exonerated between 1987 and 2009. We don’t just mean they got released, they were fully exonerated; they were wrongfully convicted. Systems fail, and the criminal justice system fails often. “Jeanne’s ability to see in somebody who is the most loathed the possibility, not the realization, but the possibility of becoming their best fully human self is astonishing. She challenges all of us to not stay in our little safety zone of who’s allowed to have the status of human error. She challenges us to really think about that. Ever since she can remember — all the way back to the starry night in the Texas countryside, when she was a first-time camper, looking into the heavens and noticing how “vast and majestic God is” — Bishop’s faith has illuminated her way. It’s why she became a Cook County public defender, leaving behind a plum post at a top-notch Chicago law firm. And why, along with her sister Jennifer, she worked ceaselessly against the death penalty and spoke eloquently for gun violence prevention, exoneration of the innocent and the role of faith in the debate over executions. It was why, in the long shadow of the Langert murders, she forgave Biro. But the journey she’s taken ultimately reached a crossroad: Her brand of believing, she came to realize, demanded more than mere forgiveness. It begged reconciliation. That’s on the far side of forgiveness. And it requires two people. Two people sitting down and poring over the landscape that stretches between them, the landscape that in this case brought Biro and Bishop together on that awful April Saturday of 1990. On the first Sunday in March 2013, Bishop drove the 155 miles to Pontiac Correctional Center, the rising sun spilling gold across snowy fields dotted with stiff cornstalks. There, she pulled into the parking lot of the maximum-security prison, the gravel crunching under her tires. And she made her way through the labyrinth that is prison entry, and waited in the hallway for the buzz of the heavy steel door, and for the tattooed, 6-foot-5 Biro to step through and reach out a hand. Moments later, under the unbroken gaze of a guard, he would sit down across from her — a thick wall of glass dividing the air between them in the numbered cubicle to which they’d been assigned and escorted. The visits — the long conversations, the questions, the insistence on truth-telling — continue to this day. Every couple of months. 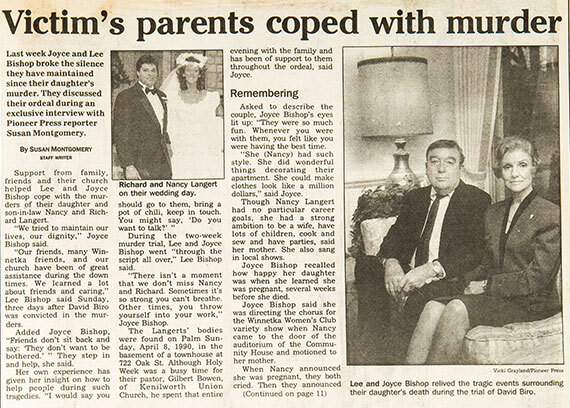 In the beginning, she says, conversation zeroed in on the horrors of April 7, the Saturday evening 23 years before, when the Bishops had gathered as a family over pasta and wine at a North Side eatery to celebrate Nancy’s pregnancy, the last time any of them would see her alive. And what evidence — if any — has she culled, what sense that something has shifted, that the change of heart is not only hers? Bishop looks straight in your eyes when she says this. It’s as if she’s just laid out the most logical truth that ever there was. She makes it sound so obvious, so inarguable. As if everyone in the world should see it so clearly. A plaque in the courtyard of Kenilworth Union Church, where Richard and Nancy Langert’s cremated remains are buried. Photo by William Franklin McMahon/Contributor. She pauses, as if to suggest that yes, of course, hearts can be changed. “There’s no way we can justify the heartless, lock-’em-up-forever-no-matter-how-much-they-change sentences. “We are throwing away human lives, we’re causing misery for them and their families. We need a system that will take into account redemption and restoration, and not just punishment and retribution. I want this to be a voice in the conversation. And that’s the truth at the change of the heart.